Descended from the extinct old English bulldog and Manchester terrier, the bull terrier was originally bred to help control vermin and to fight in the blood sports of bull and bear baiting. Today’s iteration looks as different as it behaves. With its distinctive egg-shaped head due to the lack of stop, the area between the eyes and across the bridge of the nose that typically leads to frontal facial features of the dog, the bull terrier is very recognizable. The original cross was brought about to increase fighting prowess – the lighter, more agile terrier build combined with the tenacity of the bulldog made it a formidable foe. Various combinations of bulldogs and terriers also created other pit-fighting dogs such as the pit bull and Staffordshire terrier. However, the bull terrier eventually was crossed with Dalmatian, greyhound, Spanish pointer, foxhound, whippet, borzoi and collie. The first modern version of the bull terrier, one that lacked any stop at all, is credited as Lord Gladiator and is dated 1917. While their history resides in the blood sports, the originator of the breed, James Hinks, sought a more refined companion. To this day, the bull terrier carries a cavalier attitude – not one to start a fight, the bull terrier will finish it if necessary. That said, they’re fun, playful and friendly dogs with a fun-loving personality. They love their family pack and want to be around them as much as possible – isolation in outside kennel is not a good idea with breed. The bull terrier’s muscular build and bulldog past can make it somewhat difficult to train. Positive reinforcement, repetition and consistent training – including obedience and socialization with other animals and children – from a young age will go a long way to a good behavior. Their short, dense coats are easy to maintain, and come in white and brindle. Bull terriers, much like the bulldog, are compact dogs standing 18 to 22 inches tall and weighing 50 to 85 pounds. 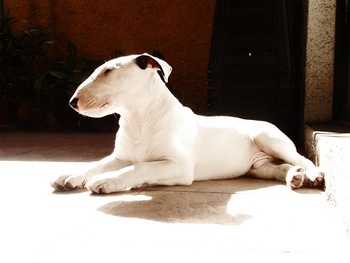 Bull terriers are a relatively healthy breed, with lifespans running 9 to 12 years. Deafness is a concern among the breed, especially the all-white variety, and puppies should be checked. Allergies can pose another concern. Neuronal ceroid lipofuscinosis 4A: Affected dogs lack adequate activity of a specific Enzyme necessary for normal metabolism. As a result, there is an abnormal accumulation of waste compounds primarily in the cells of the nervous system, leading to a range of nervous system disorders. Polycystic kidney disease: An inherited disorder of the kidneys that occurs in Bull Terriers. Affected dogs develop multiple cysts in one or both kidneys. At the beginning of the disease, affected dogs appear normal. As the disease progresses and the cysts become larger and greater in number, the kidneys will become enlarged and cause the abdomen to protrude. Primary lens luxation: Lens luxation is an inherited abnormality of the eye known to affect various breeds of dogs. It is characterized by the dislocation of the lens in the eye thought to be due to the breakage of the ligaments or zonules that hold the lens in its normal place. Affected dogs may present with sudden signs of irritation in the eye with excessive twitching, blinking and tearing of the eye. Cataracts and inflammation of the eye are also associated. I want one-stop genetic screening. Do you offer a test for von Willebrand disease?